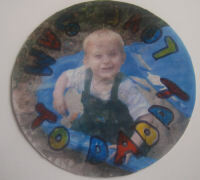 Print out a photo onto standard printer paper large enough to cover your disc. Glue the photo to the disc (the side with the picture or writing on) making sure the central image is in the centre of the disc. When dry trim to size and add a message with the pens. To seal, paint over the image and the edges with PVA glue and leave to dry. Repeat. If you wish you can make your coaster extra-hardwearing by using acrylic varnish rather than PVA glue.